During the Pleistocene Epoch, from about 1.5 million to 10,000 years ago, the world grew cold. Great sheets of ice, sometimes a thousand feet thick, moved down from the north gouging out the land. These harsh conditions seemed to encourage the development of giant mammals (Probably because larger animals are better at competing for scare resources like food). Among them were the Mastodon, and the Mammoth. Mastodons and Mammoths were closely related to today's elephants. The Mastodon was slightly shorter than an elephant, but more heavily built with upward curving tusks. Mammoths ranged in size from a dwarfed form (6 foot high) up to the Imperial mammoth that stood 14 feet high at the shoulder. 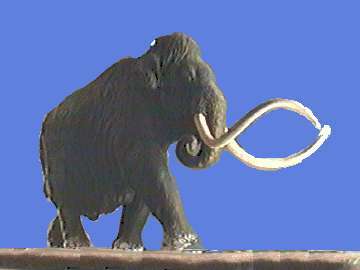 Mammoth tusks curved downward. Both were covered in thick yellow-brown or reddish brown hair. These animals were vegetarians and probably feed primarily on leaves. Mastodons were just slightly shorter than an elephants, but more heavily built. Both the mastodon and the mammoth were hunted by humans and this may have contributed to their disappearance after the end of the ice age. Ken's hole, a cavern near Torquay, Devonshire, England, shows evidence it was home to early hunters. Examination of the bones there suggest these men and women must have been successful at hunting mammoth and other now extinct animals. Other Pleistocene creatures include the Gigantopithecus, a huge ape larger that current gorillas. Glyptodon, a giant armadillo-like animal, that had a shell some five feet in length, not including the animal's head or war club-like spiked tail it used for defense. Camelops, as the name implies, was an oversized camel that lived in North America. The Irish Elk, Megaloceros, was larger than any existing deer and had antlers that spread 13 feet across. 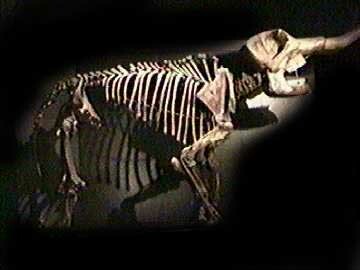 There was also a rhinoceros, or Elasmotherium, that had a six foot long spear for its central horn. Predators of the Pleistoncene included the Dire Wolf, Canis dirus, which was larger than current wolves, but the most famous predators were the Saber-toothed cats. Some were capable of hunting and killing even the largest Pleistoncene games like the mammoth. One of the strangest creatures of the Pleistocene was the Megatherium, or Giant Sloth. They were huge relatives of today's tree sloth. Tree sloths are small, sleep creatures that seem to move in slow motion. They spend much of there life hanging upside down from a branch. Megatherium, in contrast, spent his life on the ground and used his size to reach up to eat in the trees. Earlier in the century speculation ran high that in some remote corner of the world like Alaska or Siberia, mastodons or mammoths might still be found alive. They have not been. What has been found, though, are the carcasses of mammoths that were trapped in ice crevasses and kept frozen over the last 30,000 years. So well preserved were these animals that their meat was still edible. 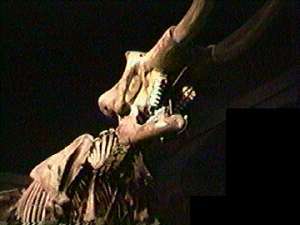 Other Pleistoncene animals not found in ice were fossilized in tar pits. We know that the dwarf branch of mammoths survived on Wrangel Island in the Arctic Sea north of Siberia until just 4,000 years ago. About the same time the pyramids were being raised in Egypt, the last mammoth died. More recently, in 1918, a story was told to the French Consul in Vladivostok, Russia, by an elderly hunter about how he tracked a huge animal for several days. When he caught up with it he found it was "a huge elephant with big white tusks, very curved. It was a dark chestnut color. It had fairly long hair on the hind quarters, but it seemed shorter on the front. I must say I had no idea that there were such big elephants." Are there other giant creatures from the pleistoncene hiding somewhere? There are stories of early European explorers seeing elephant-like creatures in North America, but there is apparently no proof. Ramon Lista, an explorer, geographer and adventurer of Argentina in the late 1800's, was convinced that South American jungles hid surviving giant sloths. He even claimed to have seen a gigantic armadillo, but was unable to kill it and bring it back to display it to civilization because his bullets just bounced off the monster's armored body. Copyright 1996, Lee Krystek. All Rights Reserved.